Is it true, as Aesthetic Realism said years ago, that man’s deepest desire, his largest desire, is to like the world on an honest or accurate basis? And is it true, as Aesthetic Realism said later, that the desire to have contempt for the outside world and for people and other objects as standing for the outside world, is a continuous, unseen desire making for mental insufficiency? 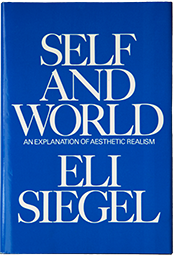 The large difference between Aesthetic Realism and other ways of seeing an individual is that Aesthetic Realism makes the attitude of an individual to the whole world the most critical thing in his life. Aesthetic Realism in 1941 first said that it was one’s way of seeing the world which caused mental mishap or difficulty. And it was in the same year, 1941, that Aesthetic Realism said the useful way of seeing mind was to look upon it as a continual question of aesthetics…. Aesthetic Realism states that ethics begins with the human obligation to see everything, living and not living, as well as one can. Where we get away from this obligation or don’t see it, or diminish its meaning, it is rather clear that contempt is showing its strength; indeed, is winning. The first victory of contempt is the feeling in people that they have the right to see other people and things pretty much as they please. For this reason, the viewpoint of Aesthetic Realism that we have an obligation to see everything as well as we can, is a critical matter. The fact that most people have felt there is no such obligation, that they had the right to see other people and other objects in a way that seemed to go with comfort—this fact is the beginning of the injustice and pain of the world. It is contempt in its first universal, hideous form…. There are two means, as Aesthetic Realism sees it, of bringing some satisfaction to ourselves. The first is the seeing of something like a sunset, a poem, a concerto, which can stand for the world and which pleases us through what it is: its structure in mind, time, and space. This is the aesthetic victory, which is the most sensible of all victories. The other victory is our ability to depreciate anything that exists. To see the world itself as an impossible mess—and this is often not difficult at all—gives a certain triumph to the individual…. It happens that music is felt always as a oneness of motion and rest, or of difference and sameness. A person, like music, is an aesthetic reality; for every moment of his life, he is at once rest and motion, sameness and change. Aesthetic Realism sees the largest purpose of every human being as the liking of the world on an honest basis. If, as Aesthetic Realism believes, all the sciences, let alone all the arts, present reality as constituted or shaped aesthetically, reality or the world can that much be liked. Aesthetic Realism does not bid people to like reality; it does bid people to hope to like reality and to do all they can to like it. A seeing of the sciences in their relation and where they begin, is a means of seeing the world favorably; with order and surprise. Aesthetic Realism is personally useful; it is all for personal development; but it is always a seeing of the whole world, and a hope not to miss anything which tells us what the world is. Aesthetic Realism, then, is unabashed philosophy, as it presents the moment as friendly to a person; as perhaps wider, deeper, more of oneself than was thought.